We’d love your help. 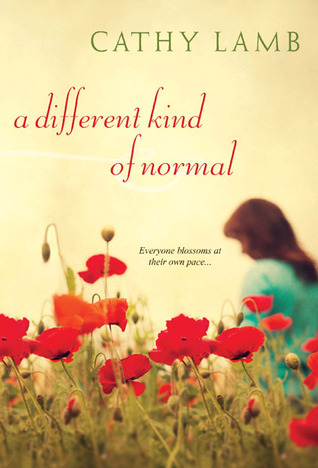 Let us know what’s wrong with this preview of A Different Kind of Normal by Cathy Lamb. From acclaimed author Cathy Lamb comes a warm and poignant story about mothers and sons, family and forgiveness--and loving someone enough to let them be true to themselves. . .
Jaden Bruxelle knows that life is precious. She sees it in her work as a hospice nurse, a job filled with compassion and humor even on the saddest days. And she sees it in Tate, the boy she has rais From acclaimed author Cathy Lamb comes a warm and poignant story about mothers and sons, family and forgiveness--and loving someone enough to let them be true to themselves. . .
Jaden Bruxelle knows that life is precious. She sees it in her work as a hospice nurse, a job filled with compassion and humor even on the saddest days. And she sees it in Tate, the boy she has raised as her son ever since her sister gave him up at birth. Tate is seventeen, academically brilliant, funny, and loving. He's also a talented basketball player despite having been born with an abnormally large head--something Jaden's mother blames on a family curse. Jaden dismisses that as nonsense, just as she ignores the legends about witches and magic in the family. Over the years, Jaden has focused all her energy on her job and on sheltering Tate from the world. Tate, for his part, just wants to be a regular kid. Through his blog, he's slowly reaching out, finding his voice. He wants to try out for the Varsity basketball team. He wants his mom to focus on her own life for a change, maybe even date again. To ask other readers questions about A Different Kind of Normal, please sign up. I have read other Cathy Lamb books and really enjoyed them. I was sorely disappointed with this one. The whole story was just too hokey and unbelievable. The constant sexual innuendos, their behaviors, the characters just didn't seem believable. Even the behavior and goings on of their ancestors was too over the top. The only one who I thought was "real" was the drug addicted Brooke. She was the only character that I think I could have found in real life. I know it is supposed to be a feel good st I have read other Cathy Lamb books and really enjoyed them. I know it is supposed to be a feel good story, but I wasn't buying it. Fiction books are made up stories, but at least for me, their has to be some semblance of reality. I don't know as I could be quite the martyr that Jaden was. Caden's behavior at the basketball games? Really? A cheerleader? I thought they had cheerleaders at high school basketball games. The comments made by the students and others in the gym during the game were most certainly inappropriate and in this day and age, would NOT be tolerated, and they would have been ousted from the game. Even the comments and behaviors made by Tate's family were inappropriate. And Jaden? Whoa. I know that as parents we can all be protective of our children, but Jaden had her bear claws out and attacked. Not adult behavior for sure. I never write reviews but I didn't want readers to miss out on other Cathy Lamb books because of this one. I enjoyed it as a quirky fiction book with lots of heart but it is nowhere near her other books. Her other books are relatable. They are about women I know or sometimes me. She talks of experiences with raw emotion and lots of humor. I wish I knew these people! I lent out The Last Time I Was Me and never got it back. I think I'll buy it again on my Kindle because it was that good. There are page-turners, and then there are page-flippers. Page-flippers are books that inspire you to flip through them, looking for the next part that's relevant to the plot. I actually enjoyed this book quite a bit after I decided to skim it; it has a strong cast of main characters, some fun plot points, and some genuinely moving exchanges. It also has about 200 pages of fluff and repetition. Had this book been only 200 pages, I probably would have laughed, cried, and bought it for all my frie There are page-turners, and then there are page-flippers. Page-flippers are books that inspire you to flip through them, looking for the next part that's relevant to the plot. I actually enjoyed this book quite a bit after I decided to skim it; it has a strong cast of main characters, some fun plot points, and some genuinely moving exchanges. It also has about 200 pages of fluff and repetition. Had this book been only 200 pages, I probably would have laughed, cried, and bought it for all my friends. As it is, it got a lot of eyerolls and a quick return to the library. The plot involves bullied kids, disabled orphans, brave/funny/brilliant disfigured kids, sad drug addicts, dying nice old people, and a self-sacrificing earth mother, so I'm going to come off as totally heartless by criticizing this thing, but I'm going to anyway! The rundown: Jaden is the single mother of a disfigured, genius highschool boy, who was abandoned by Jaden's drug-addict sister when he was 2 hours old. His dream is to play basketball. Jaden is scared he'll get 1) mocked and 2) injured or possibly killed; any rough action MIGHT dislodge the shunt in his brain. The argument between them over whether or not he can join the team is repeated so often you could make it a drinking game. The first few times it was moving; boy with dreams, mom with valid concerns. After a while, I wanted them both to just shut up about the dratted basketball team, and I LIKE basketball. The son, Tate, has a blog about his disfigurement that, naturally becomes a big hit. We are told repeatedly how brilliant this budding chemist/neuroscientist is, but his blog reads like the writings of a bright 8 year-old rather than a genius 16 year-old. I've read blogs by my high school and college students, and they were more informative than these entries. They were not believable based on his precocious, mature character, and the blog was the first thing I started skimming. Jaden works as a hospice nurse, and repeated scenes with a new cast of patients every few chapters are done to death, pun intended and regretted not a whit. Again, at first these scenes were exciting. Her reflections on the various ways sick patients and their families face the inevitable death, and a complication with one obnoxious adult son decides to make trouble, intrigued me. After a while, though, I felt like I was rereading the same scene. There are some humorous, zany scenes with her nieces and nephews that just didn't quite work for me. There is a lot of basketball. Did you get wish there were more Quidditch scenes in Harry Potter? You will love this book! Do you like reading scenes when a kid gets bullied, and then some other guy who would normally be on the bully's side, but is now disgusted by his cruelty is all "HEY STOP BEING A JERK, I'M ASHAMED OF YOU!" and then the bullied kids get dragged out of the room, and then that happens about 10 more times? You will like this book too! The best part of the book was Jaden's history of magic and her relationship with her mother and drug addict sister; witchcraft supposedly runs in her family, though she doesn't believe it. We get some terrific stories about her ancestors. Jaden herself gets premonitions when she works with herbs, and for most of the book, she keeps smelling death, which naturally freaks her out even more regarding her son's safety. The worst part, for me, was the love interest angle and the ensuing dialogue. Can I just say that I really don't like love scenes in which 1) a man declares his love 2) the woman declares her love 3) the woman argues that she is not lovable (I'm so temperamental, etc) and 4) the man argues that yes, she is (I love your passion)! Kiss first, fish for compliments later, sez I. A Different Kind of Normal – A Heart Felt Story! I loved this book. It really hit home. One of the main characters in this book was born with a big head. The medical term for this is called Hydrocephalus. I have a relative that was born with this same condition. This made the book come alive for me because of that fact. Tate Bruxelle, was born with a big head. His real mother, Brooke, abandoned him after birth. She simply walked away from the hospital leaving Tate there. Jaden Bruxelle, the sister A Different Kind of Normal – A Heart Felt Story! Tate Bruxelle, was born with a big head. His real mother, Brooke, abandoned him after birth. She simply walked away from the hospital leaving Tate there. Jaden Bruxelle, the sister of Brooke, at nineteen years of age took Tate to raise as her own; giving him the care he would have never gotten if Brooke had stuck around. Tate called Jaden, Boss Mom . Jaden and Brooke’s mother Rowan Bruxelle, a Hollywood movie star, also played an important part in Tate’s life. Tate called Rowan, Nana Bird. Tate also had a name for his big head, General Noggin. There are many other supporting characters in this book that are just as loveable as the main characters. You will come to love them as I did. I experienced many emotions while reading this book. Laughter, oh my goodness there is so many laugh out loud moments in this book. There is anger, because some people are just plain mean. There are moments of great sadness and loss. Most importantly there is love and plenty of it. The family in this book is a very supporting family. The love just flows. The caring is outstanding. This book shows how a true family lives and even though it is fictional, you get good goose bump moments from it. I really loved that about this book. A family sticking together through thick or thin is what it is all about. I took away from this book that compassion is very important. Letting go of hurts is very important. Forgiveness is very important. Don’t spend your life hating what you can’t change but loving what you can. The author Cathy Lamb is a new author to me. This is the first book I have read of hers. It won’t be the last. She has a way with words describing each and every scene as if you were right there in it. She knows how to bring out compassion, support, caring, forgiveness, and love in her main characters. To sum it up, I just can’t say enough about this book. I wish to thank Kensington Publishers for providing me with an ARC copy of this book to read and review. The opinions expressed are mine alone. I can sum this book up in one word: Beautiful! In true Cathy Lamb fashion, readers are brought a story that will make you laugh out loud, and is absolutely certain to bring forth tears of empathy and grief. It's what Cathy Lamb does best, and it's probably why she truly is my favorite author. Lamb's newest novel tells the story of 17-year old Tate. Born to a strung-out and drug-addicted mother (Brooke), and adopted at birth by his 19-year old aunt (Jaden), Tate's life will be anything but easy. L I can sum this book up in one word: Beautiful! In true Cathy Lamb fashion, readers are brought a story that will make you laugh out loud, and is absolutely certain to bring forth tears of empathy and grief. It's what Cathy Lamb does best, and it's probably why she truly is my favorite author. Lamb's newest novel tells the story of 17-year old Tate. Born to a strung-out and drug-addicted mother (Brooke), and adopted at birth by his 19-year old aunt (Jaden), Tate's life will be anything but easy. Likely due to his biological mother's drug abuse and lack of any prenatal attention, Tate is born with a very enlarged head and lopsided eyes which make him appear freakish to strangers. To his family - his Boss Mom (adopted mom, Jaden), his Nana Bird (grandmother), and his uncle and cousins - Tate is beautiful. He's brilliant and funny, and he teaches his family that love and laughter heal tears. When Tate begs to go out for the basketball team, Jaden's overprotective and hovering tendencies begin to smother her enthusiastic son. Can Jaden put aside her fears and allow Tate to behave like a normal kid? Can she step back and allow him to handle, in his own way, the teasing of strangers without pounding them to a pulp with her bare hands? A Different Kind of Normal is what fans of Lamb have come to expect: a story of love and family, beautifully written with strong characters, some sadness, and a whole lot of humor. She simply never let's us down! Finally getting to read a new Cathy Lamb book is like being on a diet for a whole year; eating only fresh fruits and vegetables, but yearning for that warm chocolate lava dessert at your favorite restaurant. You finally decide to treat yourself, so you feel the need to eat it slowly and savor every single bite because you know - when you're done - you'll have to go right back to those ho-hum fruits and veggies you've been existing on for the last year. I've finished my "dessert." I wish I could say I ate it slowly and savored every single bite, but the truth is that I shoveled it in with a serving spoon in each hand. It's going to be a long year while I wait to see what Cathy Lamb has in store for us next. Jaden is a hospice nurse. She is mother to Tate, a teenager with Hydrocephalus. Her family is quite a cast of characters from her soap opera actress mother, to her drug addicted sister, to her single dad wrestler turned florist brother, and her nieces and nephew. Jaden struggles for that delicate balance between encouraging normalcy and protecting her physically fragile son.And she frequently comes out on the over-protective end. Tate has a large misshapen head. And of course this sets him up f Jaden is a hospice nurse. She is mother to Tate, a teenager with Hydrocephalus. Her family is quite a cast of characters from her soap opera actress mother, to her drug addicted sister, to her single dad wrestler turned florist brother, and her nieces and nephew. Jaden struggles for that delicate balance between encouraging normalcy and protecting her physically fragile son.And she frequently comes out on the over-protective end. Tate has a large misshapen head. And of course this sets him up for ridicule from his classmates. Tate while not immune to the taunts, barbs and sometimes physical assaults by his peers,has a sunny disposition and has learned to deflect some of the teasing with humor.But as a teenager he longs for acceptance and just wants to be "normal". One of the guys. And he wants to play basketball.But convincing Boss Mom as he calls her, is not going to be easy. While Jaden takes center stage with her conflicting feelings about her family background,her emotionally draining job,her sister who can't seem to stay clean, and her love for Tate's neurosurgeon,this is really Tate's story. And it is a difficult,mind bending journey for him as he finds his way through the mine field that is high school. I loved this young man,with his humor and grace, and his occasional outbursts of frustration and temper. I understood Jaden in her attempts to protect him from harm. And more than anything I understood her rage at those who made his life more difficult through ignorance and cruelty. Why do editors give well-known authors a "pass"? This book was in dire need of editing, and would have done well as a much shorter book, say 200-250 pages or so. Jaden is a strong character as a caring, involved, hospice nurse. She is raising her drug-addicted sister's child, who suffered brain and head birth defects due to his mother's drug use when she was pregnant. The premise is strong, however, the book bounces all over the place. Ancestors who were witches, a mother who is a soap opera sta Why do editors give well-known authors a "pass"? This book was in dire need of editing, and would have done well as a much shorter book, say 200-250 pages or so. Jaden is a strong character as a caring, involved, hospice nurse. She is raising her drug-addicted sister's child, who suffered brain and head birth defects due to his mother's drug use when she was pregnant. I enjoy this author however, I think I may be outgrowing her writing style. She always has the one over the top female character who insists on loudly claiming her body parts, and her female characters cannot seem to hold a conversation with the men they are attracted too. The male characters are either terrible or wonderful there is no in between. She always has that one male character that was once a football player who is depicted as manly but overly sensitive. About mid-way though this book I was going to give it a rating of 3 stars, then it turned to 4 stars and by the end, it was definitely a 5! I couldn't put it down, even as I waited in Great Clips for my boys to get their hair cuts.......tears streaming down my face. (Yes, I did get a few looks from the patrons:). A very touching story. Loved it! I’m surprised by the poor reviews. I loved this book. It was fun, quirky and just a good story. Don’t put too much thought into it - if you’re looking for literature read Wuthering Heights or something. This book should just be read for pleasure. Love reading about magical mystical powers and what regular herbs can do not only in spells but healing humans. Centuries earlier the twin sisters had some fights: the powers that be set a spell on the sisters and it showed up down the family tree with one male child, Tate being deformed at birth: a huge head, eye not where it should be etc, making him appear to be a monster. His mother won't allow him to play sports as he's a teen now due to his medical conditions. He starts a blog and tells of his life and he gets many followers and he enjoys getting to love their comments. It's his way of dealing with not being accepted into the public. His real mother Brooke was into drugs also and had left him with her sister: Jaden who is raising him now and been more to a mother to him than anyone. There are other deformities of other relatives as well as the years have gone by. Tate and his mom do spend time with Ethan, Tates doctor. They've been to the beach. Also Tate can take care of himself, not only did he ace the PSAT's, he is big and when others make fun of him he beats them up til they are his friends. She still won't let him play basketball and he keeps trying to convince her. She's a hospice nurse and tries to make others passing more peaceful and no pain. Jade and Tate live with her mother, Nana Bird and she's a soap opera actress that does love scenes. They watch on the weekends together. He's made the team and Jade is excited for him and scared cuz of his medical conditions. Tate's real mom is back on the scene, recovered and rehabbed. Death smells, high school dances, college, lawsuits, and death and how they all cope makes this a super down deep read. All I can say is that this is a different kind of novel. Lamb creates characters that are so real you want to sit down and chat with them yourself. The story is about Jaden, a hospice nurse who took over raising her abandoned nephew when she was only 19. Her drug addicted sister left her physically challenged newborn at the hospital leaving Jaden to do the only thing she knew to do; to love that child with all heart and to fight for his survival, raising him as her own. Tate, the abandoned child All I can say is that this is a different kind of novel. Lamb creates characters that are so real you want to sit down and chat with them yourself. The story is about Jaden, a hospice nurse who took over raising her abandoned nephew when she was only 19. Her drug addicted sister left her physically challenged newborn at the hospital leaving Jaden to do the only thing she knew to do; to love that child with all heart and to fight for his survival, raising him as her own. Tate, the abandoned child is now 17 and knows all the things people say about him and his over-sized head, uneven eyes,and.. odd-looking ears. But Jaden and her quirky family know Tate for his astounding intelligence, his strong determination to be "normal", and most of all, his heart full of love and understanding. 4 1/2 stars. I REALLY liked this book. I actually kind of loved it, but did get a tiny little bit tired of Jaden's refusal to let Tate play basketball. It's understandable that that was the best way to demonstrate her worry and concern for him, but it did become somewhat belabored. To her credit, Cathy Lamb made Tate's rebuttals honest, funny, and at times, heartbreaking, so even thought it was a bit of a flaw for me, it was most definitely not a dealbreaker. I don't do book synopses in my review 4 1/2 stars. I REALLY liked this book. I actually kind of loved it, but did get a tiny little bit tired of Jaden's refusal to let Tate play basketball. It's understandable that that was the best way to demonstrate her worry and concern for him, but it did become somewhat belabored. To her credit, Cathy Lamb made Tate's rebuttals honest, funny, and at times, heartbreaking, so even thought it was a bit of a flaw for me, it was most definitely not a dealbreaker. I don't do book synopses in my reviews so suffice it to say that that little issue aside, this book was a HUGE home run for me. I loved the characters, most especially Tate, but found every one of them touching and endearing. And who couldn't relate, in some way, to this wonderful story of parenting, love, growing up, letting go, and coming together? This book had an interesting plot, but seemed very self-conscious in writing style and kind of annoyed me. I thought, "Even I could do better than that." I'm not quite sure how to articulate what I mean; just that some of the writing or content choices seemed too precious or over-the-top (triplets named Harvey and Heloise and Hazel? Really? ), and with so many over-the-top elements that the story was ultimately not believable enough to feel right. I saw a few other reviews that said the story touc This book had an interesting plot, but seemed very self-conscious in writing style and kind of annoyed me. I thought, "Even I could do better than that." I'm not quite sure how to articulate what I mean; just that some of the writing or content choices seemed too precious or over-the-top (triplets named Harvey and Heloise and Hazel? Really? ), and with so many over-the-top elements that the story was ultimately not believable enough to feel right. This was unlike any book I've read before. It was very heartwarming with some humor and just a little bit of magic thrown in for good measure. This book had a great mix of characters and everyone of them seeped into your heart. I really couldn't clasify this book into any particular genre, it's just an excellent story about a slightly abnormal family. This was the first book I have ever read by Ms. Lamb but I will definately try another one. This story engaged me on several fronts: the strongest story line was about how it felt to not be normal and I really thought that Cathy Lamb did an excellent job of letting me as a reader see it through the eyes of the teenager born with a deformity and through the eyes of his mother. I also was moved by the impact that the drug addicted daughter had on her family. This was a perfect summer book. The characters were wonderful. Tate is the most kind, gentle of giants. He is beautiful. There are so many wonderful, life affirming messages in this story. It was a great way to end my summer reading. I loved this book, it didn't strike me right away, but I ended up enjoying it. So glad to read about a strong woman, gives me hope there are a few men out there who like us. It also made me miss my crazy family. Cathy Lamb, you have done it again. You've made me laugh out loud and weep in public; you've given me visions and inspiration and a racing heart; characters I care for deeply. I don't know how you do it, but please, don't ever stop. We need a 1/2 star option on good reads--I think this book is nearly perfect & deserves a 4 1/2 star rating!!! if you are in the mood for a 2 hankie book this is it. I would probably give this 3 1/2 stars. Not my favorite Cathy Lamb book, but still very good! fabulous book - read anything you can get your hands on by Cathy Lamb!!! Cathy Lamb was born in Newport Beach, California. As a child, she mastered the art of skateboarding, catching butterflies in bottles, and riding her bike with no hands. When she was 10, her parents moved her, two sisters, a brother, and two poorly behaved dogs to Oregon before she could fulfill her lifelong dream of becoming a surfer bum. She then embarked on her notable academic career where she e Cathy Lamb was born in Newport Beach, California. As a child, she mastered the art of skateboarding, catching butterflies in bottles, and riding her bike with no hands. When she was 10, her parents moved her, two sisters, a brother, and two poorly behaved dogs to Oregon before she could fulfill her lifelong dream of becoming a surfer bum. She then embarked on her notable academic career where she earned good grades now and then, spent a great deal of time daydreaming, ran wild with a number of friends, and landed on the newspaper staff in high school. When she saw her byline above an article about people making out in the hallways of the high school, she knew she had found her true calling. After two years of partying at the University of Oregon, she settled down for the next three years and earned her bachelor’s and master’s degrees in education, and became a fourth grade teacher. It was difficult for her to become proper and conservative but she threw out her red cowboy boots and persevered. She had no choice. She had to eat, and health insurance is expensive. She met her husband on a blind date. A mutual friend who was an undercover vice cop busting drug dealers set them up. It was love at third sight. Teaching children about the Oregon Trail and multiplication facts amused her until she became so gigantically pregnant with twins she looked like a small cow and could barely walk. With a three year old at home, she decided it was time to make a graceful exit and waddle on out. She left school one day and never went back. She likes to think her students missed her. When Cathy was no longer smothered in diapers and pacifiers, she took a turn onto the hazardous road of freelance writing and wrote almost 200 articles on homes, home décor, people and fashion for a local newspaper. As she is not fashionable and can hardly stand to shop, it was an eye opener for her to find that some women actually do obsess about what to wear. She also learned it would probably be more relaxing to slam a hammer against one’s forehead than engage in a large and costly home remodeling project. Cathy suffers from, “I Would Rather Play Than Work Disease” which prevents her from getting much work done unless she has a threatening deadline. She likes to hang with family and friends, walk, eat chocolate, camp, travel, and is slightly obsessive about the types of books she reads. She also likes to be left alone a lot so she can hear all the odd characters in her head talk to each other and then transfer that oddness to paper. The characters usually don’t start to talk until 10:00 at night, however, so she is often up ‘til 2:00 in the morning with them. That is her excuse for being cranky. She adores her children and husband, except when he refuses to take his dirty shoes off and walks on the carpet. She will ski because her children insist, but she secretly doesn’t like it at all. Too cold and she falls all the time.